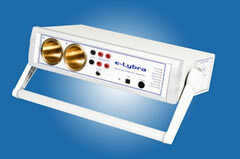 This section provides information about the key features of the e-Lybra Bio-Field Balancing System. The basic principle of the e-Lybra system is to look for imbalances amongst the different structural elements which contribute to the ‘whole’ human body. Such elements include the spiritual, emotional and energetic bodies, all of which - when correctly in balance - contribute to the well being of the complete or whole physical human body. If imbalances are detected then the e-Lybra will search for appropriate energetic remedies to help resolve each imbalance. With a database incorporating hundreds of thousands of energetic patterns available to draw on as required, the e-Lybra system software includes an automated scan/balance function which identifies issues and works interactively during each session to assess which patterns to deliver, and then to transmit them. Alternatively the Practitioner can utilise the Formula Processing facility which delivers a preset sequence of remedial patterns to address a known and specified health issue. For further information on these topics and also details of our training and support programmes for Practitioners wishing to work with e-Lybra as part of their business, click the links below. For a richer and deeper discussion of the theory behind energy medicine itself, together with a description of some of the energy medicine disciplines that the system offers, see the section called Concepts of Energy Medicine. Overview of e-Lybra 9Learn more about the operation and potential of the system. The Scan / Balance ProcessThe basic automated facility which can create a profile of imbalances in the client at the current time, create a suitable selection of remedy pattern categories to work with, and then apply them as necessary during the session. Remedy ProductionUse the huge range of remedy patterns stored within the system, plus any patterns that you have sampled yourself, to make conventional remedy solutions or pills. Formula ProcessingCreate your own lists of remedy patterns which can be used to target specific conditions, and apply them directly to the client. Categories ListA listing of the categories of remedy patterns that come with the system. About the SoftwareInformation about the type of computer that you will need in order to run the software. TrainingLearn about the 2-days of one-to-one training that is included in the price, and get an idea of the further training events we have held - both in the UK and in other countries. Building a BusinessBuying an e-Lybra system is an investment, but can you actually run a business with it? Definitely, and many people do. Here are a few ideas on how to go about it. I got my first e-Lybra 9 in 2011 and my appreciation of its abilities just continues to grow. Some of the results my clients are seeing are greatly life changing for them and their families and the process is so simple for them with remote sessions. It allows me to work the hours I want to while still providing a high quality service for clients wherever they are.